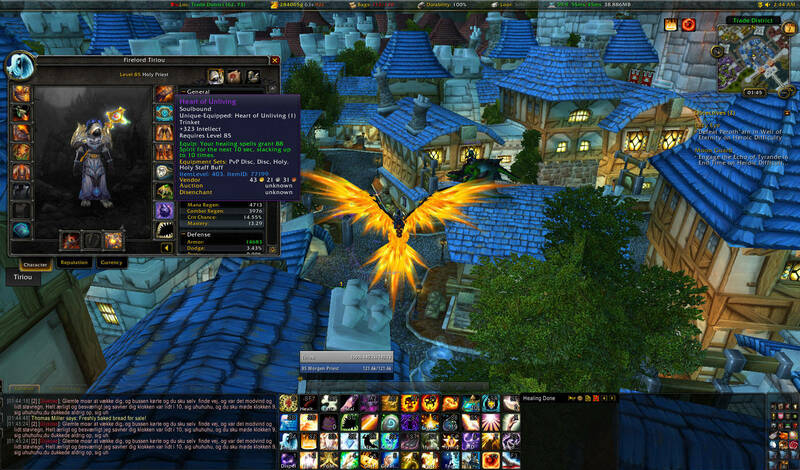 Now has 286 Intellect on it, additionally to its current equip bonus. Just picked this up for my holy pally. I can confirm that it has 286 int as well as the spirit proc in live. The spirit proc works just like the one from DMC Tsunami, and as far as I can tell, they stack, which is awesome for regen sets. Raid Finder edition has 286 int. The buff (Expansive Mind) is not refreshed by HoTs (Riptide, Earthliving). This kinda sux compared to Darkmoon Card: Tsunami. What am I missing? The raid finder version of this is inferior to Darkmoon Card: Tsunami which is iLvl 359 vs iLvl 390... is this blizzzard's plan to keep the cards relevant? Precasting a on your raid before the pull ensures you have 780 spirit as soon as the fight starts. Currently classified as a healer classes restricted (paladin, druid, priest and shaman) item, along with plenty of items in Raid Finder difficulty being restricted by classes, too. It looks like Atonement healing doesn't proc this either. I suppose this is better than Darkmoon Card: Tsunami if you're a straight healer and OOM a lot. Right now I have both of those equipped, replacing the Petrified Pickled Egg, I didn't notice that one proccing very often. I'll play around with the pairings a bit. Does not proc from neither Healing Rain first cast nor HoT part. can anyone confirm if this procs off smite healing for atonement disc priests? A little tip for druids. 1 Wild Growth will give you 5 stacks (6 if glyphed) so throw up a WG as you pull. Just looking at my character sheet, on my moderately geared paladin with judgements of the pure up, the spirit buff is worth over 800 mp5 (in combat) when stacked to 10. I would assume it would be the same for a holy priest. Casting Mind Sear on a friendly target can trigger one stack. This leads me to believe the act of casting certain types of spells (not just healing) on a friendly target is the programmed trigger for this item (note that there are exceptions such as Pain Suppression). This trinket seems to be popular for Holy Pala PVP. Lots of people taking it over a resi emblem etc. Equip: Your healing spells grant 4 Versatility for the next 10 sec, stacking up to 10 times.